One of the most static categories is that of employers: to make a practical example a person could spend up to 8 hours at work sitting in front of a computer, then going home and spend a couple of hours in front of the TV before sleeping for 7 hours; that means that he spent 70% of his day in an unresponsive position. An unsustainable rhythm in the long run, which may cause serious physical and psychological shortcomings. A real danger that in the past has been too often underestimated by companies and workers but today seems to have become more considered. An incorrect sitting position kept for a long time can cause damage to the entire column. Nerve pain, backbone and cervical pain are a recurring problem for those who spend many hours in front of a videoterminal. The pancreas is a gland that produce insulin, a hormone responsable for the delivery of glucose to the cells, which use it to produce energy. Muscles are the place where most of the glucose is consumed; when the muscle cells remain inactive for a long time, the insulin receptors are "deactivated", which is thus excessive in the blood. Exposing your body to a prolonged excess of insulin can result in diabetes. When people are seated burn less fat and blood flow is slower, allowing fatty acids to clog more easily venous channels favoring the accumulation of cholesterol, with consequent risks of cardiovascular problems. According to recent studies an insulin growth can trigger a colon cell growth; thus could modify the physiology and regularity of genetic transformations: an organic phenomenon that according to scientists could be the basis for the gradual development of tumor masses in the intestinal area. To avoid health risks is first important to sit well (and never for too many consecutive hours). The goal of those who sits at the computer should always be to take a correct position: shoulders relaxed, well-lined trunk and the entire sole of the foot on the floor. In this sense ergonomic seats can strongly reduce the risk to arise pains and pathologies. It's equally important to take frequent breaks - at least 5 minutes every hour - walking and stretching your back and legs muscles. To overcome these issues would also be advisable to consider the adoption of a desk for your computer that allows to stand up for the working day. 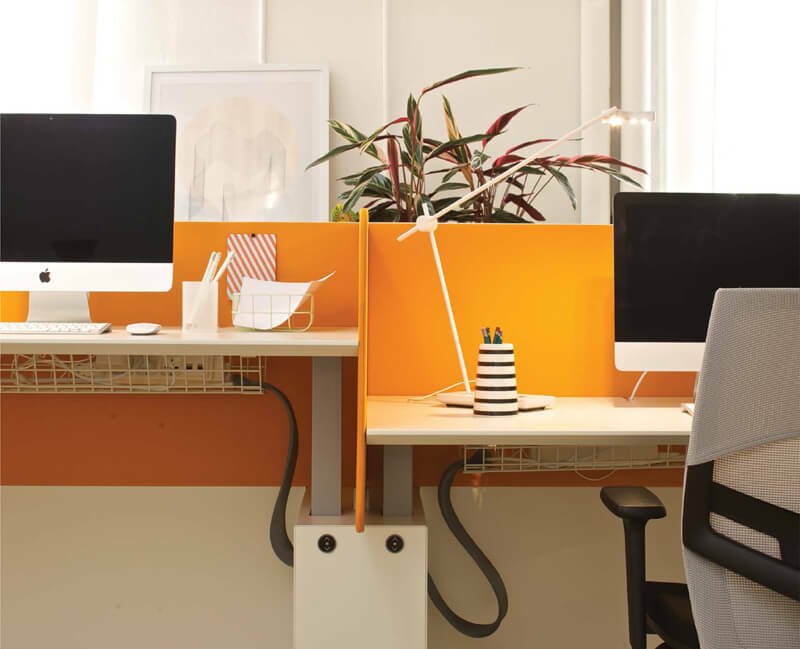 Sit&Stand desks allow to alternate sitting and upright posture, improving the performance of the workers and producing a significant physical benefit. EVO, is the newest Estel product, a system of desks that responds to the most recent ergonomic indications: alternating the two postures of sitting and standing has been proven the best solution for working in an office, promoting focus, concentration and well-being.